Gunshot wound of the brain followed by fungus cerebri, and recovery with hemiopsia. Journal : Photographic review of medicine & surgery ; vol. 1, no. 3. Description : pp. 26-30,  pl. ; ill.: 1 photo., 1 fig. ; 24 cm. Subject : Head — Injuries; Hernia cerebri. Authors caption: "BY W. W. KEEN, M.D., AND WM. THOMSON, M.D." Reprint: Keen & Thomson, (1871), Transactions of the American Ophthalmological Society. New York: D. Appleton & Co.; (pp. 122-127 w/ 2 fig.). Reference: Otis, (1865), Circular No. 6, S. G. O. Washington. Cited: Barnes, (1870), The Medical And Surgical History Of The War Of The Rebellion. Part 1., vol. 2. (pp. 206-207). Eponym: Keen's operation — omphalectomy. Eponym: Keen's sign — increased diameter of the leg at the malleoli in Pott's fracture of the fibula. The wound of entrance (see photograph — the head was shaven in order to have the photograph taken) is marked by a slight depression in the bone, the wound of exit by a hollow two and a half by two inches, and one inch deep. No bone has closed this opening, but the scalp and hair dip down into the hollow. The arterial pulsations are barely perceptible. When recumbent, the hollow is gradually obliterated and replaced in about one minute by a rounded protuberance. To prevent pain during this change, he supports the parts with his hand. When he coughs, even with moderate force, the. depressed scalp instantly bulges up in a cone, which nearly reaches the general level of the skull and obliterates the depression, and then as suddenly subsides. From the Transactions of the American Ophthalmological Society. 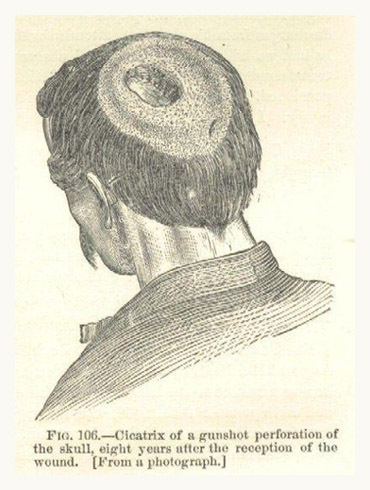 Depicted by the photograph is a much studied Civil War injury, the case of Private Patrick Hughes who survived a gunshot wound to the brain, inflicted during Sumner's charge at Antietam in 1862. After the wound was dressed by a field surgeon, the patient was transported to Mount Pleasant Hospital in Washington where he was treated by Acting Assistant Surgeon Thomas Carroll, who filed the first of many physician reports. A published account appeared in Circular No. 6 issued by the Surgeon General's Office for the year 1865, and revised by Barnes in 1870 for the first surgical volume of the MSHWR, illustrated with a lithograph reproduction of a watercolor commissioned by Dr. J. H. Brinton. Barnes also included excerpts from the Keen and Thomson report. Although the injury was massive, requiring the periodic shaving of large fungal growths, the patient recovered and exhibited little behavioral change, later working as a puddler in a foundry. However his eyesight was altered and the authors looked for evidence that Hughes had suffered decussation to his optic nerve. Ophthalmology was Thomson's specialty, he made significant contributions to American ophthalmic surgery during his lifetime and he probably wrote this part of the paper. Thomson was also a passionate advocate of medical photography, recognized for helping to establish and direct the photographic division of the Army Medical Museum during the Civil War. Later in life, he shared his love of photography with his friend and portraitist, the painter Thomas Eakins.